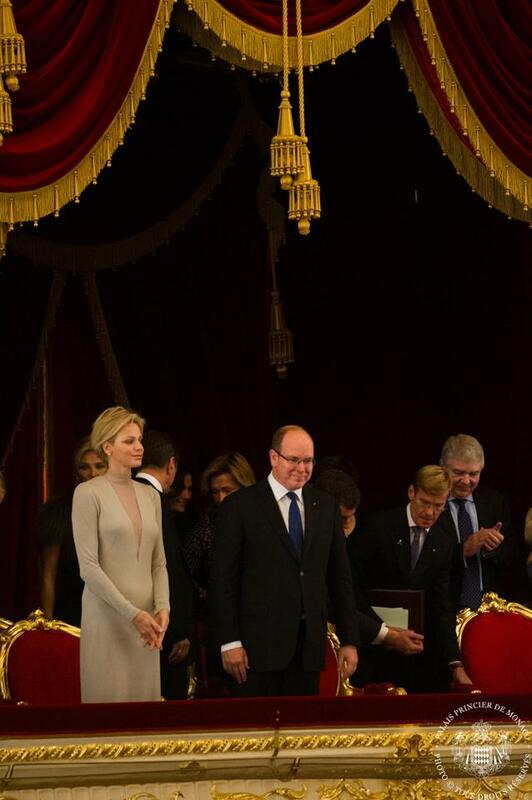 Worn in Week: Princess Charlene Wears Akris to Moscow! 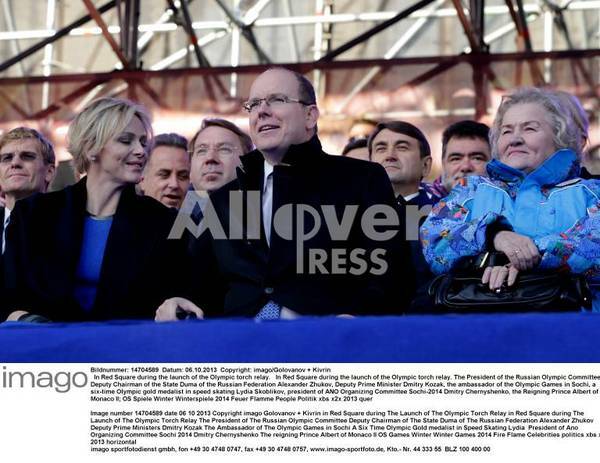 Prince Albert and Princess Charlene visited Russia from the 3rd to the 7th of October, the trip was kicked off with an audience with the Patriarch. Charlene repeated an Akris suit that she wore in 2011 for some Christmas functions. Nothing interesting here, let's move over, folks! On the 4th of October Albert and Charlene attended an evening gala at the Bolshoi where the Ballet de Monte-Carlo performed along with the Bolshoi. Charlene wore a long Akris coat and a gown from the Fall 2013 collection, the gown was seen on the runway in black. Char's dress seems to have the panel less sheer and the sleeves modified. She paired it with a grey Alice purse from Akris and what seems to be her pearl earrings. I'm loving this hairstyle, but not digging the bland color! On the 5th, Charlene gave a swim-class for children in the Olympic Water Stadium in Moscow. Later that evening, The Prince and Princess of Monaco attended a a dinner prepared by the Monaco starred chef Alain Ducasse with some dignitary guests. Charlene wore THAT dress that created all the buzz. In her defense, the dress is lined and she has worn it once before that time to the Akris cocktail party and it looked fine with the lighting there! This dress is called St. Gallen and is available online on Saks for $3990, you can buy it from HERE, Just make sure you don't get your pictures taken with loads of flash! According to Getty, on the same night they attended a heavy weight title fight between Wladimir Klitschko and Alexander Povetki, but I think it was on the 6th! Anyway, Charlene wore these black leather pants, black heels and a printed top, none of these is by Akris, if you have an idea about the designer, please do tell. That's a nice change from the usual Charlene attire! The next day (the 6th), the couple attended the Olympic torch relay! A blue dress, a black coat and the diamond stud earrings, finally color! What do you think of Charlene's outfits for the visits? That St. Gallen dress, with or without the lining, is creepy! I like this dress, it is very beautiful. It happens to anybody, I remember it happens to Princess Diana in a kindergatden and I will not speak about a transparent dress that Kate wore at the universitat fot a fashionshow for students.and who became very famous. Worn in Week: Charlene and the Unknown!